If the River Thames is a song, whose sedate opening bars of its Kemble source belie its climactic, rousing sing-along chorus in the City, before its fade-outro into the expanse of the Canvey estuary and beyond, the Henley/Marlow stretch is the delicate, melodious first verse. For it is here that the river enjoys a slower pace of life. Pleasure boats abound, ensconced on either side by heavy, green willows shielding picturesque Berkshire villages. And along this tranquil stretch of one of the world’s great rivers, sits Hurley Riverside Park. At first glance, Hurley Riverside Park might seem like the kind of commercial touring park you would not normally expect to see recommended by Cool Camping. It’s a huge 200-pitch site with a high percentage of caravans, large motorhomes and static holiday homes. Hedges are neatly trimmed, pitches are clearly marked and an automatic barrier needs to be negotiated on entry and exit which, for some, may feel more ‘airport car park’ than ‘back-to-basics campsite’. But get over it, people, because this is the gateway to a Thames-side camping paradise. It must be said, the tent pitches themselves are not by the river, but set back behind tall hedges in a separate camping area. 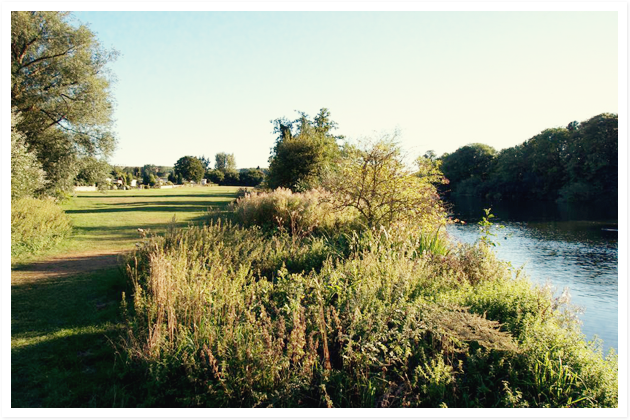 The area between the river and the pitches is the riverside picnic grounds, a long, semi-wild meadow, perfect for playing games, running around, eating al fresco and choosing which of the passing boats you would choose if you won the lottery. It’s a special spot indeed, with the lush green countryside of the Thames Valley all around, red kites circling above, and the river traffic gliding by. And, unbelievably, all barely an hour from central London. The park has been run by four generations of the same family for the last 40 years, prior to which it was one of the region’s loveliest working farms. This rural heritage and family-friendly atmosphere is plainly in evidence today with the resident llamas and pygmy goats. The park also boasts accolades aplenty, including the prestigious David Bellamy Gold Award for Conservation, for the last 15 years. Hurley even has it’s own guided nature trail which follows the length of the campsite. With canoeing, kayaking, fishing and a whole host of other waterbound activities to enjoy all just an easily-reachable drive from the capital, Hurley Riverside Park is a fantastic base for campers fleeing the frenzy of urban living. It’s also a short distance from regal Windsor, the attractive riverside market town of Henley-on-Thames, and further afield, the dreaming spires of Oxford, so there’s no shortage of great day trips to be enjoyed. Whether or not you’ll get to these places on your home-made raft, however, is anyone’s guess.